Both reports paint the same, very grim picture of the situation in Gaza. The UNCT’s “Ten Years Later” report (TYL) is more explicit than the UNDP report in naming the situation as “de-development”– a term that definitely implies a lot more agency than the UNDP’s more milquetoast word “decline”. The TYL report is also much more forthright than the UNDP report in noting that Gaza is still considered under international law to be territory under Israeli military occupation (despite Israel’s pullout of its settlers and partial pullout of its military in 2005), and thus that under the Fourth Geneva Convention, Israel still retains its responsibilities as Occupying Power for the welfare of the civilians who make up the vast majority of the Strip’s two million residents. 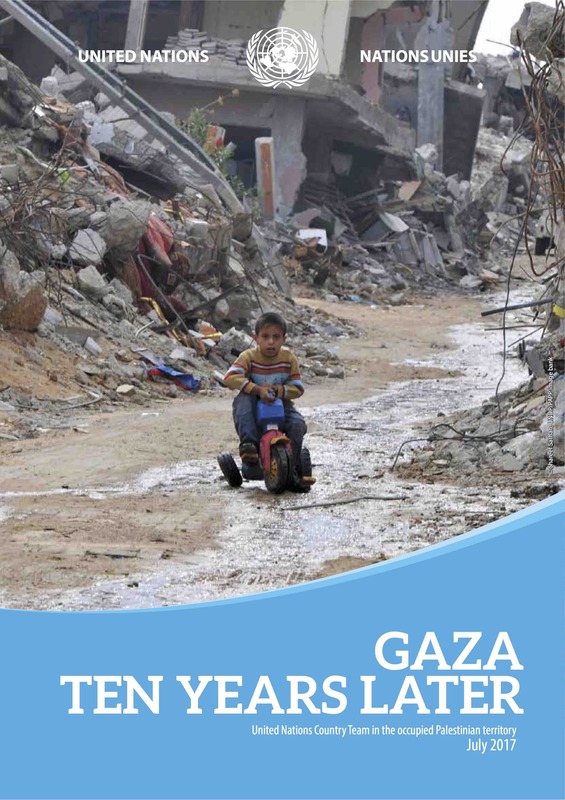 Another shortcoming of the UNDP report is that its authors seem to have drunk the neoliberal Kool-Aid in that they think that private-sector economic growth will be the best thing to pull Gaza out of its misery– if only all the various actors in Gaza would let the private sector blossom! 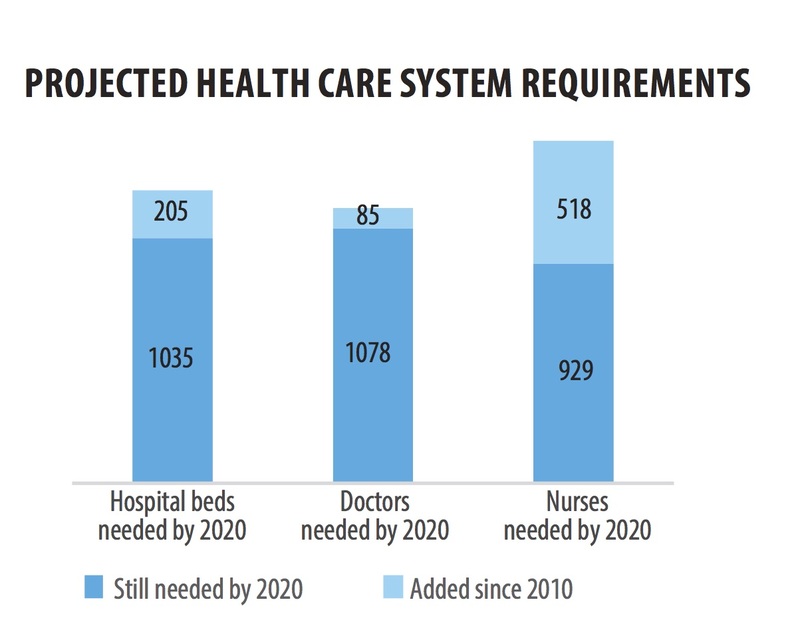 The TYL report is much more matter-of-fact in noting in detail how many more doctors, nurses, teachers, and classrooms will be needed to provide even basically acceptable services to a population in Gaza which is now projected to increase to 2.2 million by 2020. It is very unclear how, if urgent, basic needs like these are to be met, the private sector could do it? So the TYL report is definitely worth reading and referring to. The result (as in so much of the reporting of the Western mainstream media) is that the impression is always given that it is the Palestinians of Gaza who are “violent”… with the clear implication being that because of that violence somehow Israel is “justified” both in using its own massive physical violence against Gaza and in maintaining and constantly tightening the restrictions it places on the Strip’s people. Also, that any violence that Israel uses is always “in response to” the Palestinians’ (apparently quite unprovoked!) acts of violence. Firstly, this is by no means always the case, and the authors of the TYL report are quite wrong to state it thus. Secondly, if the acts of one side are described (and by implication also justified) as being “in response” to acts undertaken by the other side, why are the acts of the Gaza Palestinians not always similarly described– as being “in response to” 50 years of brutal military occupation (whose maintenance in power is achieved absolutely through the application of massive violence); continuous quite unlawful acts of collective punishment imposed on the population of Gaza; and so forth? But for a UN body to portray the (actually, very small-scale) violent acts of Hamas and other Palestinian forces in Gaza as being somehow illegitimate and beyond that as somehow “justifying” Israel’s massive and continuing application of violence against Gaza seems to me to be very unhelpful. I do realize that, since Israel is in such an overwhelmingly strong position in the occupied Palestinian territories, all entities that carry out humanitarian/relief missions in those territories, including UN entities, need to be careful not to anger the Israeli authorities too needlessly. But guys! You are the United Nations! Can’t you stand up for your core principles? Why do you need to engage in such craven acts of Israel-appeasing wordsmithing as including those (really pathetic, and wholly one-sided) “counts” of missiles sent from Gaza into Israel in your report, when they add nothing to it?